Comfortable shoe woman Calzamedi brand. On this very special occasion with comfortable wide Calzamedi 15. 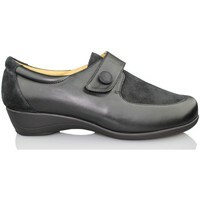 These shoes are made of smooth leather of very good quality. We also have very comfortable and breathable removable insole. Other feature of these shoes is that Calzamedi woman in the forefoot area is elastic improving adaptation and comfort to your feet. Adjusting these Calzamedi 0564 is a velcro. The sole is made of polyurethane, a material that is well attached to the ground preventing falls. 0564 Calzamedi These shoes are the best choice for daily use because they are special quality shoes so your feet suffer as little as possible.